The S2 Singlecut Semi-Hollow balances response and sustain with clarity and precision, making this guitar a perfect option for both lead and rhythm work. The classic control layout (with volume and tone for each pickup) and added versatility of a push/pull coil tap on the tone controls give players plenty of options to dial in flawless tone. 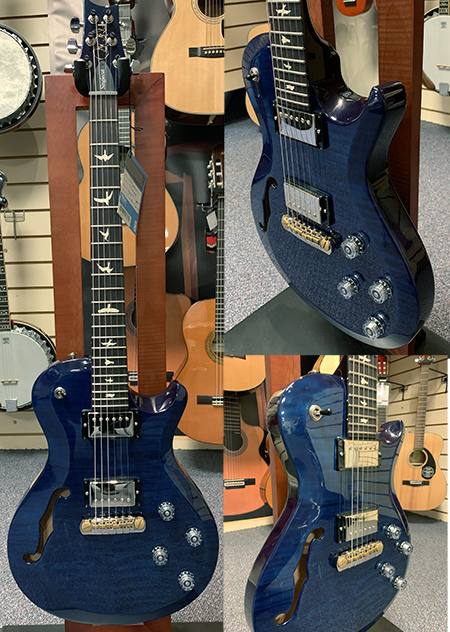 The PRS S2 Custom 22 Semi-Hollow also comes fitted with a set of S2 Locking tuners, These are a massive benefit to tuning stability making sure your strings can not come unravelled or loose which playing. They also have unplayed brass shafts to allow direct contact with the strings for improved resonance and sustain across the fretboard. As well as the Tuners one of the three main contact points for the string is the nut which is essential to the guitars tone. Prs use a proprietary nut material, designed to maximise the guitar&apos;s tonal resonance. PRS nut placement is compensated to provide accurate intonation across the fretboard. The PRS Stoptail Bridge provides direct transmission of string vibration to the guitar body, while recessed string slots on top of the bridge offer a comfortable position for your picking hand. Pre-compensated for modern strings which can be adjusted vis fine screws at each end of the bridge. The advantage of a hard tail bridge is fantastic resonance due to the direct transference of vibrations to the body allowing for better sustain as well as improved tuning stability. The guitars comes fitted with PRS S2 #7 Treble and PRS S2 #7 Bass pickups which give this guitar a classic and iconic PRS tone which is extremely clear and full sounding. Due to the Chambered body and F hole this guitar has a fantastic acoustic resonance to it making the Pickups retain amazing clarity and resonate more freely. Whether is it Heavy Rock, Pop, Or Jazz you play this guitar can handle it all, With the coil tap swell it allowed you an even wider variety of tones being able to switch the hum bucking pickups to single coils to give you that stray-like sound and output.